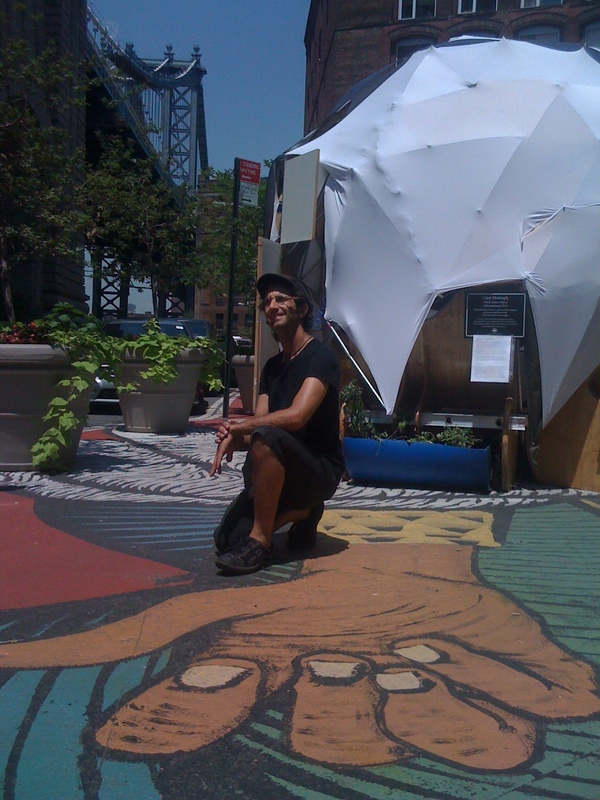 On one of the final days of my recent artists residency in NYC at the Flockhouse, I stopped by the DUMBO neighborhood in Brooklyn to do an interview for FlockhouseTV about the Groucho Fractal show and my preparations for the premiere at Boom Festival 2012. My brilliant and illiustrious collaborator Amelia Marzec conducted the interview. Flockhouses are fully autonomous sustainable urban eco-pods designed by artist Mary Mattingly (of Waterpod fame). They’re powered by solar energy and pedal crank generators. There are rainwater collection and filtration systems, gardens, composting toilets, and many other amenities. During my residency there were multiple flockhouses located around the city in public parks. Mine was located in Coleman Oval under the shadow of the Manhattan Bridge.